The launch of GST will improve the working system of the government and obliterate the bad culture of black money, laundering of income tax and corruption , stated Arunachal Pradesh Chief Minister Pema Khandu. He was speaking at a function of Institute of Chartered Accountants of India (ICAI) organised on the occasion of 68th Chartered Accountants day. Addressing the gathering Chief Minister said “Only good culture of honesty will exist,” . Chief Minister appealed the people of Arunachal to do away with old corrupt culture and enter into culture of honesty and sincerity. Speaking on the occasion, the Chief Minister welcomed the launch of GST saying that it was result of collective efforts from different governments at the centre, though it became possible only with the strong leadership displayed by Narendra Modi. He said the state GST bill was passed on 8th May this year and expressed confidence that the new taxation system will immensely benefit the state. However, the state may face hurdle in migrating from VAT system to the new GST system, he said and added that the state’s difficult topography and challenges in IT connectivity pose another big hurdle in full implementation of GST. He said the matter has been conveyed to the centre which received positive response through a team from centre visiting the state to address the implementation challenges. He informed that laying of OFC cable is going on in full swing and wherever there are internet connectivity issues it is being taken cared through VSAT. The CM informed that five regional offices of Tax and Excise are being set up for GST implementation in the state with officials already posted for these centres. He further informed that trainings are being imparted to officials to equip them to work on migration to GST system. At the end of the session, the gathering witnessed the live speech of PM relayed from New Delhi in his interaction with CA community. Before his speech, He was felicitated by the ICAI on the occasion of 68th Chartered Accountants day. 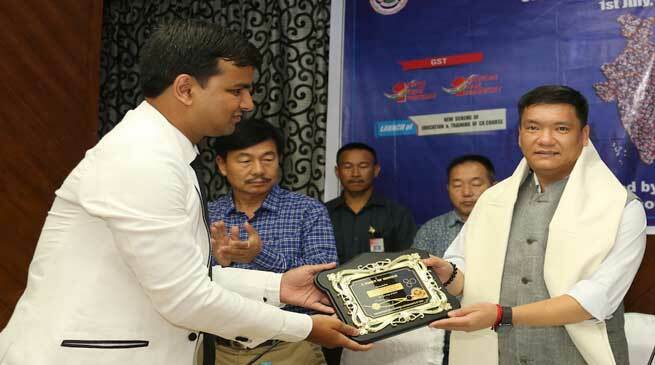 The ICAI also felicitated State BJP President, Tapir Gao and Advisor to CM, Tai Tagak that saw the celebration of launch of GST taxation system in the country during the occasion.